Team : Naor Moadav, Liat Katz, Yaacov Eisenthal, Eli Hayoon, Moshe Damkani, Li-tal Kupperman, Meir Halachmi, Ziv Nachum, Sagiv Yaari, Nadav Ofir, Gal Dalali, Itay Guy, Olga Bilder, Omer Habouba, Nufar Zin. 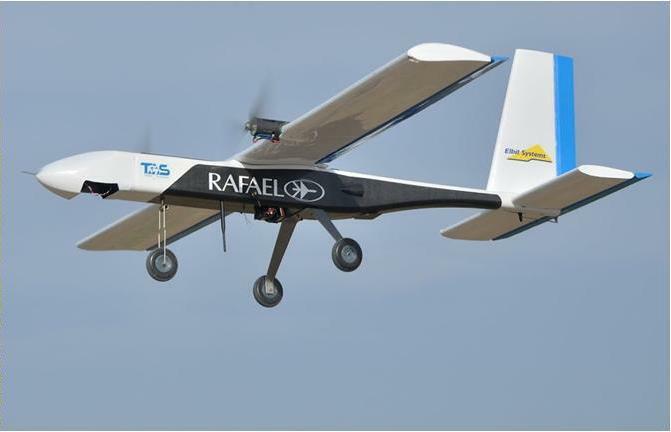 A joint team of students from the Aerospace Engineering and Computer Science departments under the guidance of Mr. Dror Artzi has developed an airborne system that carries out reconnaissance mission, targets acquisition, communication and dropping payloads on ground target, all completely autonomously. 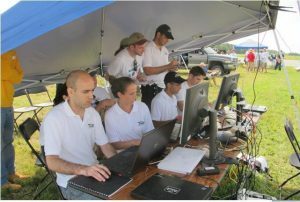 The system participated in the Annual Students Unmanned Air Systems (SUAS) Competition that took place in Webster Field USA on June 2014. The competition was organized by the Association for Unmanned Vehicle Systems International (AUVSI). About a year ago we joined the competition organized by AUVSI, in which the teams are required to develop, manufacture and fly a completely autonomous airborne system for reconnaissance and targets acquisition. The airborne system included an autonomous unmanned vehicle with two electrical engines, equipped with a stabilized camera for ground target acquisition while locating their type and exact location. The aircraft also included an airborne computer for images processing, a communication system for control and images transmission, meaning an integrative system that simulates a real operational system. In order to meet the competition’s short and challenging schedule, we took a development approach that was based on an extremely quick development of the aircraft’s aerodynamic configuration, doing a quick initial sizing and a quick building of a wooden full scale demonstrator airplane by the students in the AE department’s workshop, an airplane with which we accumulated many flight hours through which all the system’s components (photographing, computing, communication etc.) were developed and verified. All that alongside the engineering design, the analysis and the developing of image processing algorithm by the CS students. Following the aircraft configuration freeze, the team manufactured two identical aircrafts. It was made of composite materials (Gr/Ep) fuselage and wooden wing and tail, all the airborne systems were installed in both aircrafts and the team performed integration test and systems verification tests to ensure proper functioning of all the systems. In addition we performed ground tests (including wing static loading test) for both aircrafts. The system was carefully packed and shipped to the States where we received it, assembled it and immediately conducted flight and integration tests, a day before the beginning of the competition. Every system underwent extensive safety checks before it was approved for flight, including a structure and systems integrity check, a communication check and EMI checks, the Technion team had two aircrafts and both passed the checks on the first try. Immediately after, we showed the judges the system’s readiness for flight-FRR–Flight Readiness Review while presenting the entire development process and the system’s tests as well as all the redundancy mechanisms that establish the system’s reliability and safety. The plane started with an autonomous flight along several way points, then entered a search area in order to identify targets and categorize them (type, color, orientation, location pinpointing), then surveyed outside the search area to find targets, identified a human-demo target, received communications from a ground relay terminal and transmitted them to the ground station, and finally dropped a payload from 350 feet on target. The dropping was also done autonomously while the plane flew over the target, collected data (wind strength and direction) and during the following flight- path, when the launching conditions established, the system autonomously released the payload in a very close distance of 46 feet from the target. To conclude, during nine months we experienced developing of an integrative complicated system, manufacturing aircraft, conducting analysis and complex experiments, operating the entire system while applying a Crew Resource Management (CRM) methodology , performing a “simulated real life deployment” (in the USA) and brought the system to a functional peak. All that, within nine months only!